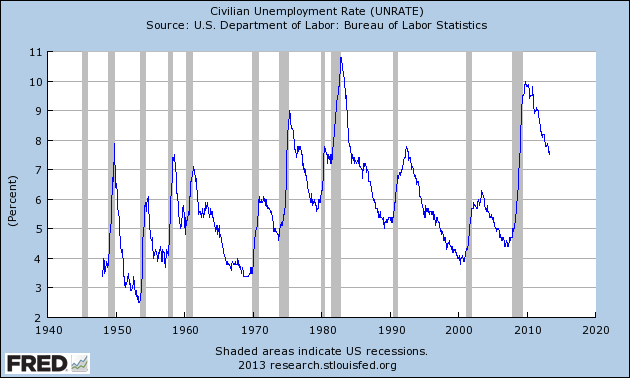 Why Does Anyone Think the Fed Will Taper? The world economy should brace itself for a slowing of stimulus by the Federal Reserve if history is any guide. Personally, I think this is nutty stuff. In enacting QE3, Bernanke made pretty explicit he was targeting the unemployment rate; the “full-employment” side of the Fed’s dual mandate. And how’s that doing? Japan, of course, tapered its stimuli multiple times at the faintest whiff of recovery. Bernanke and Yellen will be aware of this. Much more likely than abandoning stimulus is the conclusion by the next Fed chair — probably Yellen — that the current transmission mechanisms are ineffective, and the adoption of more direct monetary policy, including helicopter money. This entry was posted in Economic History, Economics, Federal Reserve, Wall Street and tagged abenomics, bernanke, deleveraging trap, fed, federal reserve, kuroda, monetary policy, qe, taper, total debt, trickle up money, yellen. Bookmark the permalink. 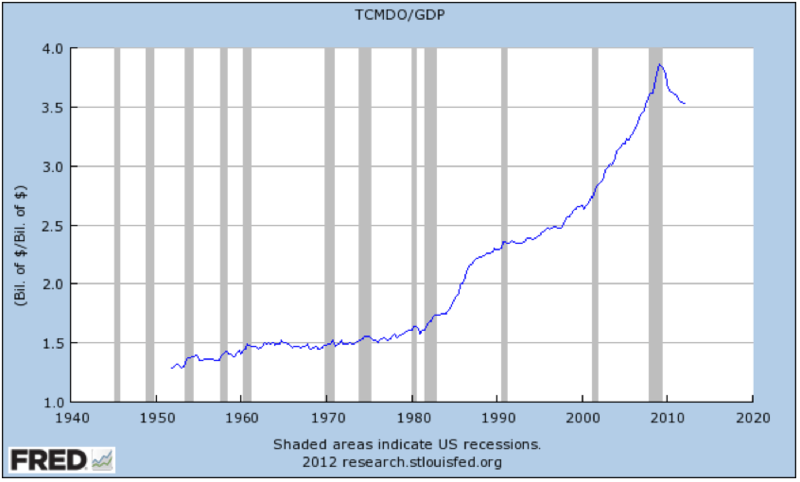 One problem: Fed’s Balance sheet. It’s not infinite. What prevents the Fed having a balance sheet of $1,000,000,000,000,000,000? The Fed can do whatever it whats until congress says otherwise. Well, if they want to sale bonds to the foreigners, they must care about the balance sheet. If they want to import from foreign countries, they must care about the balance sheet. If they don’t want crash after crash, they must care about the balance sheet. 1. 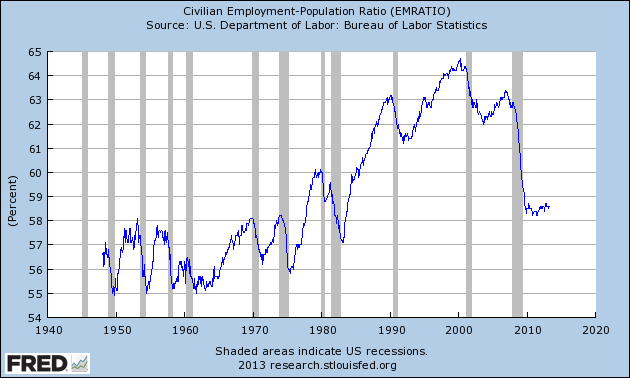 Where is the Fed’s role in employment “mandated”? 2. Do the Executive Branch and/or Congress share culpability in this mess? How? 3. Could the Executive Branch and/or Congress help now? How? 4. Unknown or unacknowledged by The Powers That Be, Article V provides for amending the Constitution. In addition to amending Amendment XVI, what could be done to help now and/or avoid future repetitions? 3. Depends on what you believe. Bernanke has been saying explicitly for a couple years that Congress needs to spend more money in stimulus. 4. What could be done to prevent future repetitions? Abolish the authorized monopoly on currency currently held by the federal reserve. The 2012 FOMC statement asserts that long-run inflation is determined by monetary policy (Fed action). May we ask — of the US and Japanese experts — how long is long-run? While not an economist, I see wisdom in Friedman’s proposed limitation of Fed powers, and better, Ron Paul’s (and your?) proposal to kill it. Pingback: Revolution for Victory News Today | Why Does Anyone Think the Fed Will Taper? And the alcoholic keeps needing a larger amount of booze to get stoned. Eventually the DT’s will come, but let’s just put it off, shall we? If you throw a big enough feast so that .01% are drowning in excess food, the peons are no doubt going to get some scraps out of the dumpster out back. Trillions thrown at the housing and stock markets are going to result in a couple more service jobs being created here, and perhaps a construction job or two there, but Bernanke has as much interest in the jobs situation as he does in reading the latest tribute to Hip Hop’s greatest all-time artists. His interest lies in creating increasing levels of collateral [via asset bubbles] for the private bankers who employ his services. What else would a banker be interested in doing? You’ve stated your belief that we need countercyclical fiscal policy. So any thoughts on David Beckworth’s proposal for a direct helicopter drop to households? I’ve had a few interactions with David Beckworth recently, and he has a really interesting perspective on a lot of issues. In that post, he is talking about the same thing I am in a number of pieces — altering the monetary transmission mechanism. Technically, I see what he is suggesting as monetary policy as opposed to fiscal policy. Nonetheless it is an interesting proposal. How about actually fixing the problems instead of lame-brain solutions like this! Imp, old friend: I think it’s obvious how “the problems” could have been prevented, but how can they be “fixed” now??????????? Remember, DG, the answer ALWAYS comes before the question. If you can articulate the problems, you ALREADY know the answers!! We had a Helicopter drop in Australia. But it was basically a refund of $900 of taxes we paid anyway (How generous) I agreed with it, because it is the individual who knows best. But it did go into frivolous purchases, and not infrastructure that builds the nation. Now the Australian Government is facing big budget blowouts. We had a huge mining boom, so I don’t know how effective it was in preventing the European style deflation and housing bust. But Australia’s 20= year economic expansion is an interesting case study. With stronger work place rules to prevent mass sackings, the consumer generally has good confidence, and the economy recycles capital very regularly. We don’t have the boom bust of the USA. Back in 2007, I said this crisis will not end until Stimulus of several times GDP is deployed. Since they can’t reduce unemployment any lower, it will be acknowledged that 7% or more is the natural rate, and inflation will rise as Chinese manufacturing prices in rising labour costs, and food and oil becomes a scarcer commodity. So I am guessing a sovereign default, UNLESS the USA is able to energy export its way out of poverty, just as Russia has over the last 10 years. On an exit strategy, if the dam ever breaks and inflation breaks out one day and interest rates have to rise, what effect would this have on our debt burdens? In other words, at what point does paying the interest on our debt become a serious enough problem to be actually concerned about? For example, if we reach 2% growth and 100% debt-to-GDP but then interest rates rise to 10% because inflation is finally seeping out of assets and into the consumer market, would this cause an even worse problem, i.e. growth to slow, the debt to grow and the burden of paying the interest exceedingly painful and problematic? PT: Let’s stop pretending that the “dam” might never “break”, inflation & interest rates rise, and “cause an even worse problem”. We could discuss how governments, businesses, and individuals can plan and prepare, but that also seems hopeless. Solutions, anyone? Maybe I did not phrase my question very well. I am thinking about those who claim the Fed cannot reduce its balance sheet because the “exit” would cause interest rates to rise which would cause difficulty paying the interest on the debt, which would cause further monetization (aka the Fed to increase its balance sheet). I am not making this claim, but I am wondering why those who make this claim are called wack jobs? What is it about this concern over the size of the debt that is so stupid?